In the normal course of life, there is a relatively easy progression of libido; energy may be directed more or less at will. This is not the same as psychological development or individuation. 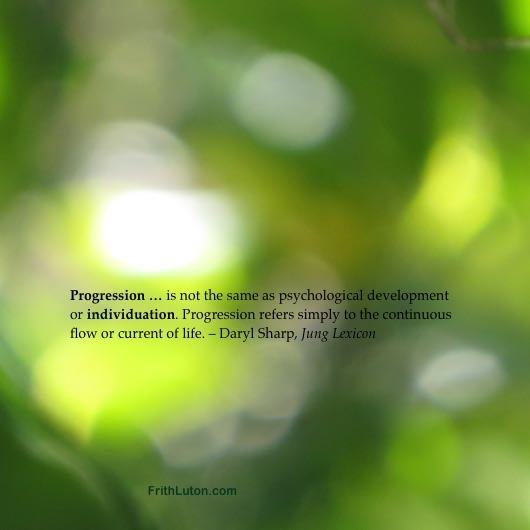 Progression refers simply to the continuous flow or current of life. It is commonly interrupted by a conflict or the inability to adapt to changing circumstances. The struggle between the opposites would continue unabated if the process of regression, the backward movement of libido, did not set in, its purpose being to compensate the conscious attitude. As the energic value of these previously unconscious psychic processes increases, they manifest indirectly as disturbances of conscious behavior and symptoms characteristic of neurosis. Prominent aspects of the psyche one then needs to become aware of are the persona, the contrasexual complex (anima/animus) and the shadow.